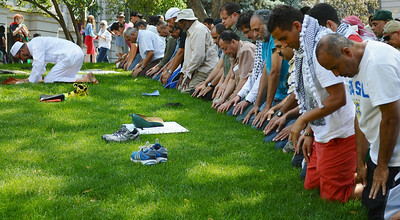 Muslim men & women praying. 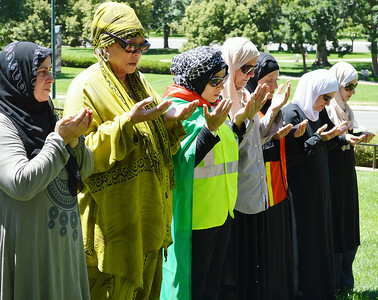 Includes rows of men and women being led in afternoon prayer by an Iman, as well as individuals and small groups praying at a rally. Row of Muslim men kneeling, being led in prayer by Iman dressed in white, bullhorn by his side. 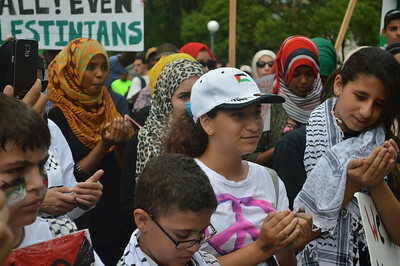 Row of Muslim men bowing in prayer, Iman dressed in white in front of them bowing, bullhorn at his side. 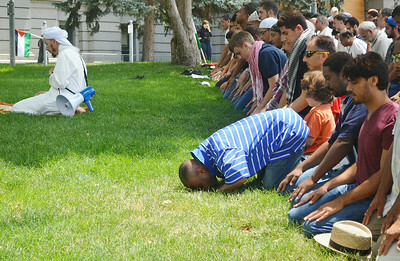 Iman, dressed in white, kneeling on ground, leading a row of Muslim men behind him, in prayer. 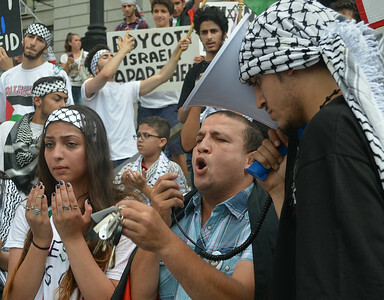 Muslim men kneeling over to pray, some wearing Palestinian flags draped on their shoulders, Iman dressed in white in front of them, onlookers in background. 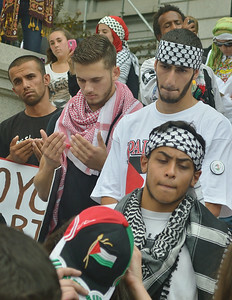 Four Muslim men bow in prayer onto Palestinian flags, three wearing keffiyehs. 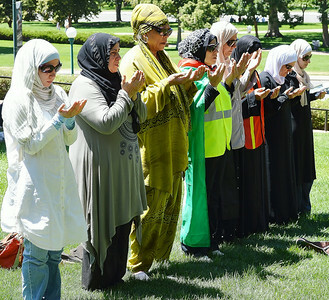 Line of Muslim women wearing hijabs, kneeling in prayer. 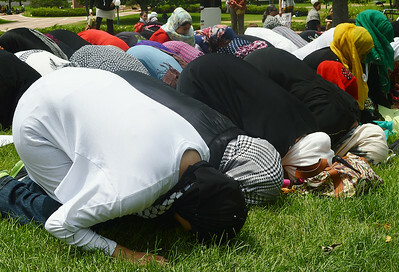 Line of Muslim women, all wearing hijabs, bowing to the ground in prayer. 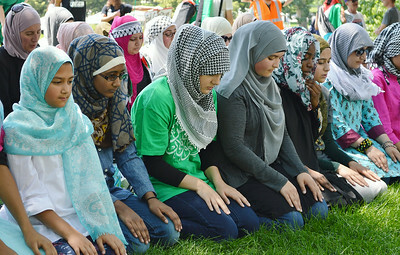 Row of muslim women bowing in prayer. Line of Muslim women wearing hijabs, raising hands in proyer. 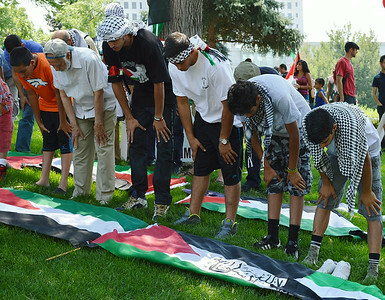 Muslim men kneeling in prayer, two kneeling on Palestinian flag. 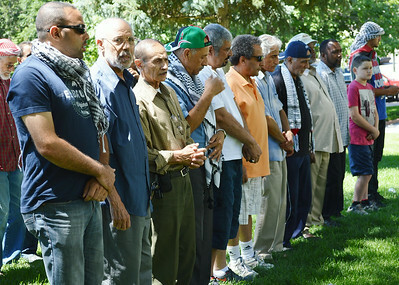 Row of Muslim men standing and praying. 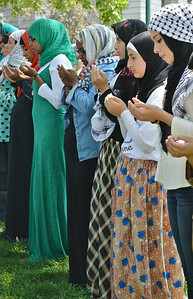 Row of Muslim women wearing Hijabs, standing with hands raised in prayer. 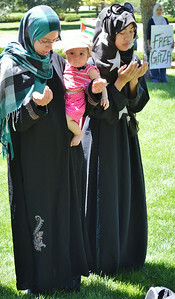 Two Muslim women, one holding a baby, both wearing Hijabs, standing with hands raised in prayer. 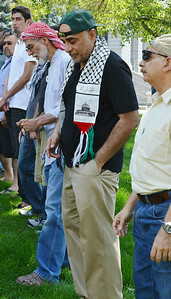 Muslim man wearing Palestinian flag on his back, bowed to the ground in prayer, row of men praying next to him. Rows of Muslim men kneeling and bowing in proyer. 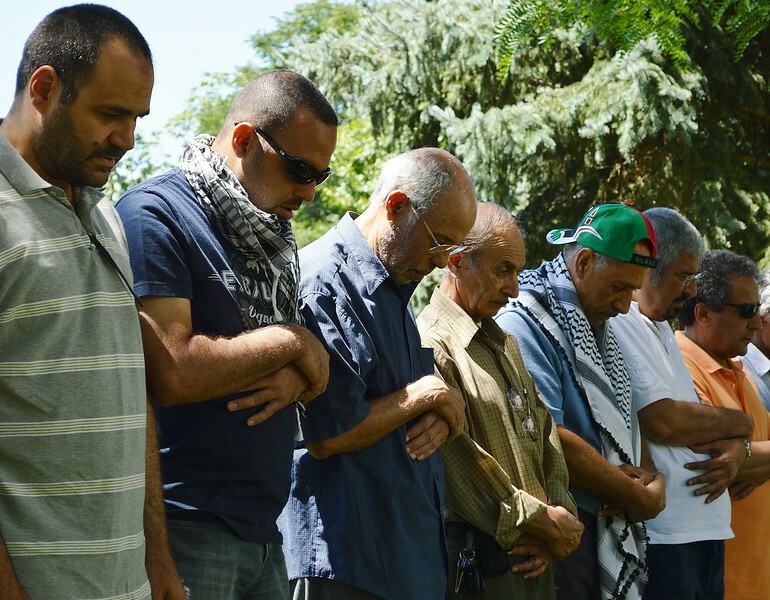 muslim man with white beard, wearing Keffiyeh, kneeling on ground in prayer, other men beside him praying while standing. 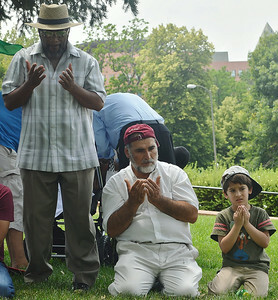 Muslim man with white beard and young boy next to him kneeling in prayer, other man stands and prays next to them. Group of Muslim men praying, one wearing backward baseball cap and scarf with picture o mosque on it, man next to him wearing traditional keffiyeh. 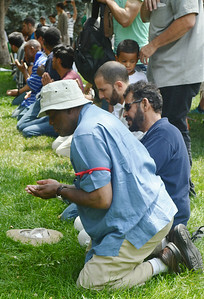 Muslim man wearing backwards baseball cap praying while standing with arms folded, other men in background praying. 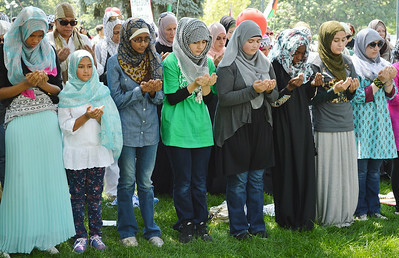 Two young Muslim women, one wearing peace sign t-shirt, hold hands up in prayer, other behind them also praying.